Playing in Paradise #54 & some other fun stuff! The challenge this week was to add stitching, either faux or real to a project. It is my hubby's birthday on Friday so I decided to make a guy card and used my CTMH stitching stamps - which I LOVE- to the card. First I actually used CTMH paper for the background, then I layered on a free vintage bicycle graphic from Graphics Fairy that I printed onto white cardstock from my printer. I embossed the bike paper with a writing Cuttlebug folder and then added some Distress Ink on top to highlight it. After mounting it onto cardstock I popped it up with foam dots. I used the stitching stamps to add black zigzag 'stitching' to the sides of the front, and inside I added a dotted 'stitch' around 3 sides. I then added a white embossed 'embroidered' flower stamp to the front and inside of the card and "I'm sew happy" to the inside as well. I have another free vintage bicycle link on Pinterest. 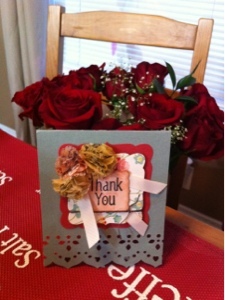 Check it out at http://pinterest.com/karlayungwirth/ on the Card and Scrapbooking Ideas board! I also had a very proud moment with my 5 year old said she wanted to do some scrapbooking after we were watching some You Tube videos! I brought her some pics I wasn't using and some supplies and she set to work doing her own thing - mental note to buy more Tombow adhesive! Anyway, she cut fringes on one of the pieces of paper she put on the page and added some Distress Ink and actually tore the edge of a smaller L shaped piece of paper and crumpled it and added Distress Ink to it. She also stamped some flowers and bugs and added some stamps that came on an envelope in the mail. Very cute! Well, I've got to head to bed before baby wakes, but I just wanted to say Thank You for reading my blog. Someone actually came up to me today at Scrapbooker's Paradise and said "I follow your blog!" and it really made my day. Thanks Angela ; ) It's been a crazy 2 months and I've missed scrapbooking and card making and posting more often, so it meant a lot to hear that! I finally got out with baby Erica and Amie to make it to Scrapbookers Paradise for their Toonie Thursday card and, as always, it was a very nice card. They used the Spellbinders Dies to cut the 3 labels on the front and made cute tissue flowers by cutting 6 layers of tissue each into a flower shape with a punch and adding a brad to the center before scrunching each layer. The tissue is by Tm Holtz and was first spritzed with a color.